Dhaka, 6 September, Abnews: The Detective Branch (DB) of police submitted a charge sheet before a Dhaka court today, accusing six people over the death of two college students in a road accident in the city's Airport Road area. DB inspector Kazi Shariful Islam, also investigating officer of the case, submitted the charge sheet to the Chief Metropolitan Magistrate Court of Dhaka on Thursday. The accused are Shahadat Hossain, owner of 'Jabal-e-Noor Paribahan' bus which is responsible for the accident, its driver Masum Billah, his assistant Enayet Hossain, owner of another 'Jabal-e-Noor' bus Jahangir Alam, its driver Zobair Sumon and his assistant Asad. Among them, Asad and Jahangir Alam remain absconding. The court acquitted two other accused Ripon Hossain and Shohag Ali of the case as they had no involvement in the incident, said Shariful Islam. 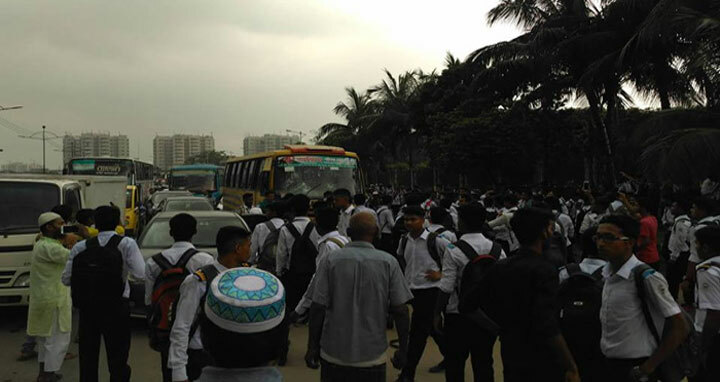 On July 29, Diya Khanam Mim and Abdul Karim Rajib, students of the college section of Shaheed Ramiz Uddin School and College, were killed as a ‘Jabal-e-Noor Paribahan’ bus ploughed through some students in front of Kurmitola General Hospital on Airport Road.